Remember my first swap I did participate, the Celebrate Spring Swap organised by the lovely Inspired Mama. Meanwhile I know my swap partner has received her package, so I can share some pictures of what I made of it. 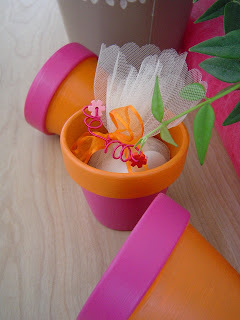 Little terracotta pots, painted in bright colours orange and pink. Filled with little chocolates. And also: Seeds. Recipe for Asparagus Quiche. Bubbles for the kids. I hope she liked it and it brightened up her spring home! Me, I received a packet from the Inspired Mama herself. 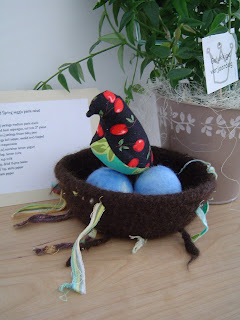 It contained a gorgeous little felted nest and bird, complete with two felted eggs. This is just beautiful! It looks great on my little spring table, but is also fun to play with for the kids. Also the recipe sounds delicious: a veggie pasta salad. Thank you very much, Erika! 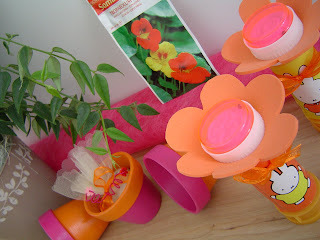 For who wants to try this spring project at home, Inspired Mama has made a tutorial you can find here. The next one will be a Celebrate Summer Swap, I'm looking forward to it! Anyone who still needs to be convinced?